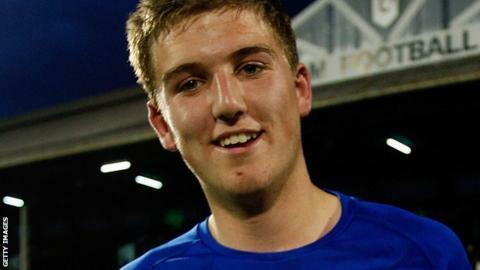 Striker George Waring scored on his professional debut to help Barnsley to victory over 10-man Yeovil. Glovers defender Ben Nugent was shown the red card for raising his elbow during a tangle with Waring. The 6ft 5ins Waring, on loan from Stoke and one of three debutants in the starting line-up, tapped in after a mistake from goalkeeper Jed Steer. And Steer's day got even worse when he brought down Barnsley skipper Conor Hourihane, who tucked away the penalty. Yeovil remain bottom of League One, having lost five of their last six games, while Barnsley moved up to 16th. "I think it was a gritty performance but it was never going to be easy. "We defended well against the wind in the first half and then we managed the game very well after the break. "The red card is indefensible and it's right in front of the ref, I don't think anyone can complain about it but I thought their keeper might have got a touch on the ball for the penalty. "It's one of the youngest sides I have ever put out so overall it was very satisfying to get the result and it will be a great boost of confidence for them." "We're disappointed, of course we are. "We believe it was a sending off. Whether it was retaliation or whatever, we're taking that as read. "But the penalty has definitely gone against us and wasn't right. Jed Steer is an honest lad and certainly for the penalty he was really upset, because he did get to the ball first." Match ends, Barnsley 2, Yeovil Town 0. Second Half ends, Barnsley 2, Yeovil Town 0. Foul by Jean-Yves Mvoto (Barnsley). Kieffer Moore (Yeovil Town) wins a free kick on the left wing. Attempt missed. Kieffer Moore (Yeovil Town) header from the centre of the box is close, but misses to the left. Foul by Milan Lalkovic (Barnsley). Milan Lalkovic (Barnsley) wins a free kick on the right wing. Attempt missed. Sam Hoskins (Yeovil Town) right footed shot from outside the box is close, but misses to the left. Milan Lalkovic (Barnsley) wins a free kick in the attacking half. Joe Edwards (Yeovil Town) is shown the yellow card. Dale Jennings (Barnsley) wins a free kick on the right wing. Hand ball by George Waring (Barnsley). Corner, Yeovil Town. Conceded by Jean-Yves Mvoto. Foul by George Smith (Barnsley). Substitution, Barnsley. Dale Jennings replaces Alex Kiwomya. Goal! Barnsley 2, Yeovil Town 0. Conor Hourihane (Barnsley) converts the penalty with a left footed shot to the bottom left corner. Jed Steer (Yeovil Town) is shown the yellow card. Penalty Barnsley. Conor Hourihane draws a foul in the penalty area. Penalty conceded by Jed Steer (Yeovil Town) after a foul in the penalty area. Attempt missed. George Williams (Barnsley) right footed shot from outside the box is too high. Corner, Barnsley. Conceded by Nathan Smith. Substitution, Barnsley. Milan Lalkovic replaces Leroy Lita. Substitution, Yeovil Town. Sam Hoskins replaces James Berrett. Attempt missed. Leroy Lita (Barnsley) left footed shot from the left side of the box is just a bit too high. Delay in match Kieffer Moore (Yeovil Town) because of an injury. Foul by George Waring (Barnsley). Goal! Barnsley 1, Yeovil Town 0. George Waring (Barnsley) right footed shot from the centre of the box to the bottom right corner.